Seeking to contribute toward a prosperous society and its sustainable development, Artemis has been engaged in various social contribution activities for the goal “a good crossdressing citizen” You could easily understand that the major players of such activities are yourself . We are very pleased to list some example of those activities bellow. 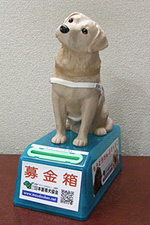 Artemis participates in raising funds the Japan Guide Dog Assocication. We are very pleased if our activities can support those people who are crossdressers helped by guide dogs in any rate. We will continue this activity for realizing "any crossdresser’s involvement to the society" . In the year 2009, 16 typhoons caused extensive flooding in Philippines. They had to face lack of food and clothing and collapse of houses. We sent immediately some number of clothes of the season taken out from stock in our salon with staff’s donation. A company named Transtech Co.,Ltd. helped us by free delivery to the site for the materials. 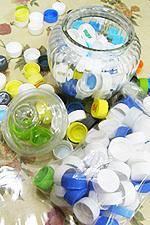 ●Co-Operation with the program of a NPO Co.
We are collecting caps for PET−Bottles day by day, and send them to the NPO Co’s collector. Each 800 caps value ￥20 which compensates the cost of getting a shot for polio-vaccine. As it is well known, there are so many children who need the vaccine but not be able to get it by the reason of poorness of their parents. The staff of Artemis , a group of females , has motherly love and deep affection for children. It seems like an instinct movement that they have started and kept collecting caps by ourselves since the year 2008. They are sure that they will continue this activity without stop. We would like to ask your kind co-operation for this Click Donation. It is free but needs your click, small time, and your interest in the world. Your click on the banner makes the company pay a donation to an NPO group. Then they will work on various social problems, including the eradication of world hunger, education, medical assistance, environmental protection activities …in developing countries. COPYRIGHT(C)2003-2011 ARTEMIS, ALL RIGHTS RESERVED.